It didn’t take long to figure out—the fearless Raider had been relegated to a toothless warrior. As the dreams began to crumble, a sinking feeling started settling in. Some sentiments in life can’t be described. How do you explain the feeling when you specially fly to a place in the desperate hope of forging a partnership, and are dismissed from the meeting in mere ten minutes! And then you are sitting lonesome in your rented car in the parking lot, wondering where to go as the return flight is still several hours away… in one flash your whole life passes by you! One interesting experience worth narrating relates to my interaction with Umang Gupta (of Gupta SQL fame). 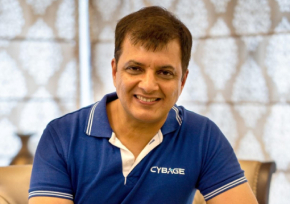 One of the most renowned Indian legends in Silicon Valley—he got interested in Cyberage, and decided to pay us a visit in Pune. Very proudly we demonstrated our visionary product in our humble apartment. I thought he was impressed. When I dropped him back at the railway station, he very sweetly slipped Rs. 200 in my pocket as a sympathetic reimbursement gesture for the Pune-Mumbai railway ticket. How I wished the ground beneath would split open, perhaps the lowest point of Cybage life. I think the importance of ‘humility’ in a first-time entrepreneur can never be emphasized enough. You may have started your business with very deep pockets of disposable inheritance or may have put everything you got on stake— regardless of the backdrop, if you are an entrepreneur, be prepared to be humbled. Again. And again. This is perhaps the reason why descendants arriving from materialistically blessed settings often give up half-way through the journey. You see, they are not used to the concept of being walked over! A big ego and an entrepreneurial spirit seldom work together. One of the ground diktats of entrepreneurship: Until the business is very well-established, you are and will remain a ‘nobody’!